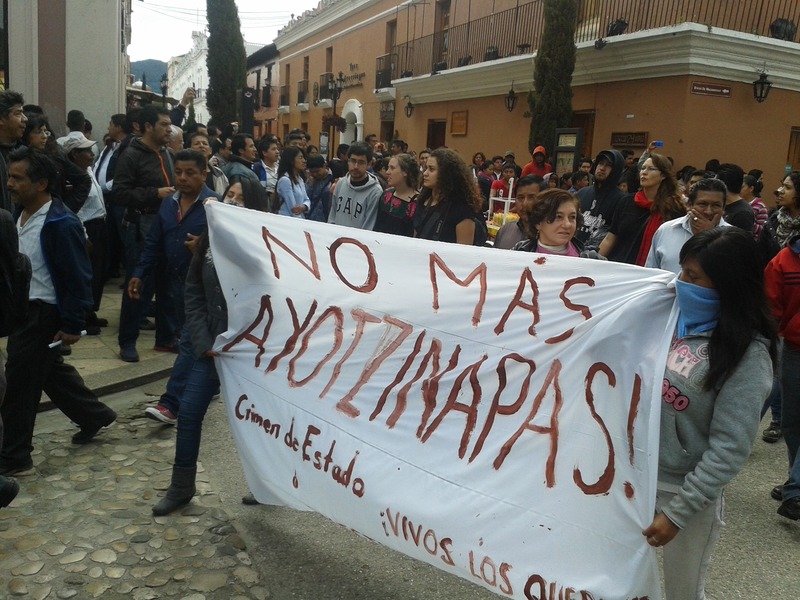 On 20 November, in observance of the Day for Global Action for Ayotzinapa, protests were held in solidarity with the relatives of the disappeared students from Ayotzianapa in many cities throughout the world. From three points in Mexico City, thousands of persons marched, accompanying caravans of students and relatives of the disappeared from Ayotzinapa to arrive at the rally in the Zócalo of the capital. After the rally, when the mobilization that had been peaceful to that point ended, a group of youth launched rockets and attempted to break down the principal entrance of the National Palace. Riot police intervened against them, as against the rest of the protestors who had not participated in this intensified phase. People were injured and arrested, but the authorities have not released any official data. Meanwhile, on social networks photographs emerged demonstrating presumed infiltrators in the protests, who were placed there supposedly to destabilize the protests. The parents of the 43 disappeared students from Ayotzinapa expressed, before hundreds of thousands of people assembled in Mexico City’s Zócalo, that “this is not just about Guerrero: all throughout Mexico there are secret graves full of persons who have been executed outside the law and forcibly disappeared.” This was their conclusion following the tour they carried out in several states of the country during the previous week, including the north and south of the country. At the act at the Zócalo, one of the organizers reported that in more than 185 cities of the world, people had come out to the streets to demand the presentation with life of the 43 disappeared students. Said demands include among others the regularization and redistribution of 1000 hectares of land from the Venustiano Carranza municipality; the cancellation of arrest-orders; the “retirement of nocturnal patrols of the specialized forces of the Army and Navy in our communities, as well as overflights performed by airplanes and even drones as well as helicopters belonging to the security forces and the Army”; the regularization of transport concessions from MOTO-TAXI, in addition to several productive, educational, and health projects. Mariano Díaz Ochoa, subsecretary for Governance in the highlands region, has signed a document in which he committed himself to a dialogue between an OCEZ-RC commission with governmental authorities, to take place in Tuxtla Gutiérrez on 7 April. 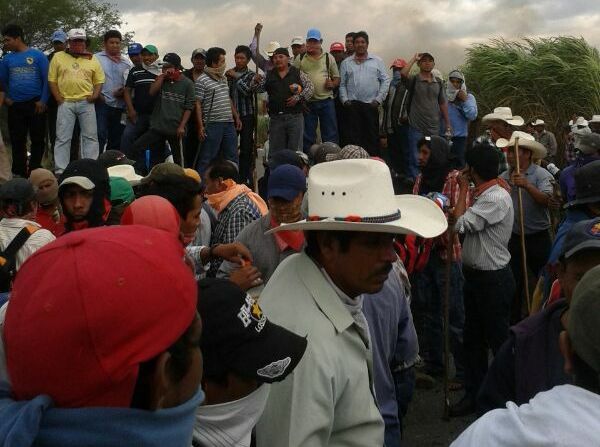 Maize producers who demand a better price for their products were intercepted by hundreds of state police when they attempted to move the protest they had been sustaining for a week in the capital of Chiapas to the region of Venustiano Carranza. The members of the Union of Maize Ejidos and Communities of the State of Chiapas demand that they be paid 5,000 pesos per ton of grain, but the authorities offer them only 3,600. The campesinos confronted the police, resulting in the burning of several patrol-vehicles, 10 injured police, and 2 arrested campesinos. Human-rights organizations denounced that the Chiapas state government is practicing repression in place of engaging with the legitimate demands of social groups. In a 27 November bulletin, the Fray Bartolomé de las Casas Center for Human Rights calls on the state government of Chiapas to cease its criminalization of social protest and at all moments guarantee and respect the rights to physical security as well as freedom of expression, assembly, thought, and association. Thus, it calls for the immediate release of those who were arbitrarily arrested by the police and for medical attention to the injured. On 6 August, civil organizations published the report “Generalized violence in Venustiano Carranza” which, according to information collected during a civil observation mission, “seeks to clarify the violent acts which took place in Venustiano Carranza on 5 Mayo 2013” between campesinos from the Emiliano Zapata Campesina Organization-Casa del Pueblo, associated with the National Front for the Struggle toward Socialism (OCEZ-CP-FNLS), and the Emiliano Zapata Campesina Organization-Chiapas (OCEZ-Chiapas). The situation of tension in the municipal head of Venustiano Carranza, which originates in a conflict between two campesino groups, has worsened in recent days with the entrance of different security forces, including the Mexican Army and Navy. 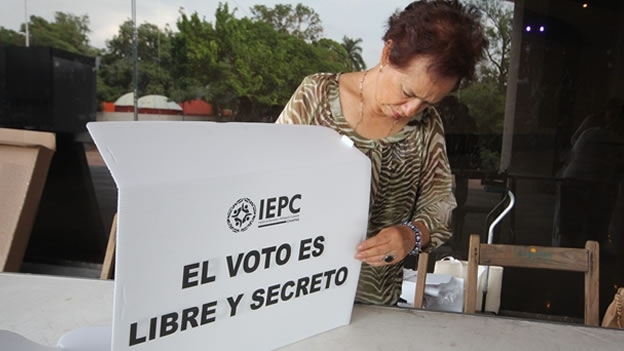 According to several denunciations and journalistic information, on the morning of 17 June were arrested Miguel Hidalgo Vázquez and Juan Noé Vázquez de la Torre, communards of the ejido of this community, by state police, the Mexcain Army, and the Navy. On the afternoon of 18 June, confrontations were seen in several neighborhoods of the community between residents and the police, leaving several injured and arrested, according to media reports. The National Front for Struggle toward Socialism (FNLS) in a 17 June denunciation indicates that the arrests which occurred on that day had been planned during a table of negiation between the state government and the Emiliano Zapata Campesino Organization-Casa del Pueblo (OCEZ-CP). The FNLS noted that the detention of Hidalgo Vázquez took place in the house of the commissar for the ejido, whom the security forces had been searching without success. For its part, the OCEZ-Carranza Region (OCEZ-RC) reported that on 17 June Juan Sebastián Espinoza Arias was arrested in Tuxtla Gutiérrez. 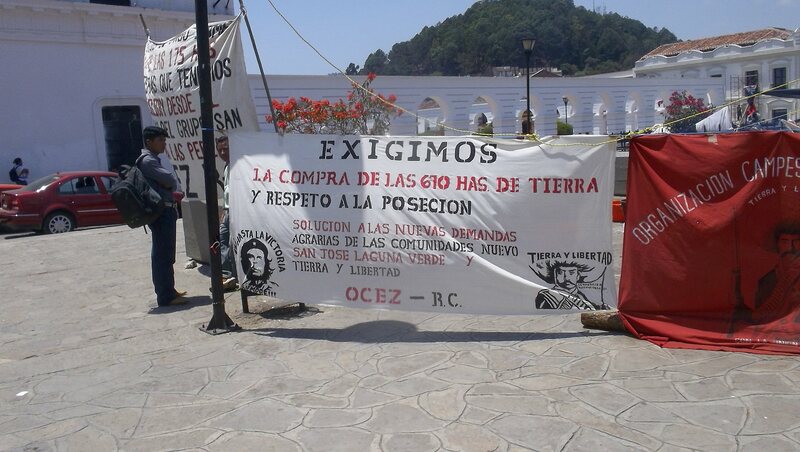 The OCEZ-RC indicated that Espinoza Arias was part of a delegation of the OCEZ-RC which found itself in the Chiapas state capital to meet with the General Secretary of Governance, Noé Castañón León, when he was beaten by members of OCEZ-Chiapas and subsequently handed over to the police. According to journalistic information, presently the members of OCEZ-CP have blockaded access to the municipal head and are holding a commander of the State Preventive Police hostage, toward the end of demanding a negotiation table with the state government.